Being honest: I am sick of people who do not pay attention to the instructions given on the site. Visitor asked not to photograph personal belonging such as human hair and what not. However many visitors still did. I find this just a disgusting behaviour!!!. 808 FREEDIVE: The claim that the new generation in Europe have nothing to be ashamed of misses the point entirely. To say "most people in Europe complicit with atrocities are long dead. Holding their offspring responsible is not how it works". Then to make it worse "US was complicit by limiting the number of Jews entering". So my "logic is flawed". The whole point is that Europe still carries this historical baggage example of mass murder on a scale never seen before. It is not a question of saying one generation guilty and the next can brush it off and claim innocence. The HOLOCAUST as the mass murder of the Jewish race in Europe is not a flash in the pan. RACISM like the murder of Jo Cox British MP by English nationalist serves as a reminder of people who hate so much they kill anyone supporting other races like Syrian Muslims displaced by war and famine as well. Norway and New Zealand killing sprees of Muslims happen when people see other races as legitimate targets. Each of these places have unique sensitivities and it is based on history, culture and the special message that the memorial or museum wishes to convey. Visitors should have some understanding before they wish to take photographies or walk on rails etc. Would a selfie on the tracks be okay? Perhaps not. I visited Jallianwalla Bagh memorial in India where British soldiers massacred Indian civilians next to the Golden temple and people seem to take selfies and no one was offended but objected if someone took photographs of bullets marks on the walls with their selfies. Likewise in Hiroshima it was different. So it is important we make an effort to understand the unique sensitivities of such places. I've been to Poland for a total of about 50 weeks on various trips. When I went to Auschwitz, the last picture I took there was just outside the gate before going in. I just did not feel right being behind a camera and not being immersed in what the Polish where trying to communicate about what happened there. Even when the reflexive feeling for taking a shot came to me, I was comfortable just letting my eye take it all in and committing it to memory and not to a snapshot that i would look at from time to time. Richard - like you, I could not bring myself to photograph at either Auschwitz or Birkenau - very moving visit and not photos needed to retain the memory! I was the same. I did not feel right taking photos in Auschwitz. No one had to tell me anything. No sign needed. I just knew it wasn't right and had no desire to photograph. Hell, I barely spoke when I was there. I sometimes wonder how others don't feel the same. This is something that should not need to be said but some don't get it. If the management of this or any memorial or archeological relic any where in the world direct you to not behave in a certain way, you comply with no questions.You are on foreign soil for starters where different social norms exist.Rationalising from your own perspective is questionable.You are overseas with the privilege of being admitted & despite paying to get there, it is not a free ticket to do as you like.Other examples are around the world & overall you look don't touch, I have seen OS tourist do it with my own eyes at NGV StKilda Road.Locals could be sensitive about heritage & the occupation of Poland was brutal under the Nazis, Auschwitz is a symbol of this oppression for Jews & other minorities & the Polish people who were regarded as lesser humans. Although I greatly dislike the act of selfies I do think it is harmless no matter what the place is unless you actively disturb people. In the end selfies for the youth today are like computer communication/videogames of my generation or the beatles of generation X. Most people who actively complain about it being bad are probably (a bit) out of touch with the current world. That said, Auschwitz is not and should never be treated as a playground. And before someone starts to lecture me on the finer details of what (his/her idea of) respect is... How respectful is it of hotels and tour operations in the neighborhood to actively advertise with Auschwitz purely for the gain of profits? Just a heads-up - there are no 'selfies' here, nor any mention of them in the article. As someone who works with teenagers, I understand the 'disconnect' between the place and the existential requirement to have fun. We were all teenagers once; stupid, self-centred and unthinking. I'd apply a stern "Oy - stop fooling about!" combined with a discussion session after the trip addressing Auschwitz, and historical context. But yes, I do understand why this behaviour is distressing for many. I like your statement "existential requirement to have fun". This will help me to understand my 14 year old. they should just ban taking selfies there and thats it...solved. People talking selfies there are just too young to understand...its just a netflix special to them...with all the social media junkies and attention calling , etc.,... a selfie to them is nothing disrespectful but perhaps the 'normal' thing to do. IdM photography Let's have the selfies forbidden by law worldwide ... Great start! Also ban front facing cameras in mobile phones ... selfie sticks can go where the sun does not shine ... no not Finland, they have the Russians to worry about. Selfie = modern incarnation of the self-portrait. Would you really ban the self-portrait? 1. The fact that you CAN take a photo doesn't necessarily mean you SHOULD take it in the first place. 2. Auschwitz-Birkenau (Polish: Oświęcim-Brzeinka) is a former German contentration camp, located in southern Poland (close to Kraków, or Cracow as you like to spell it). Yep, you read it just rigth: GERMAN. German concentration camp. German death camp. 3. Now, a death camp like this was a place where people, like you, are brought like cattle, on a cattle train, cramped in a cattle train cars, like sardines in a can. The conditions inside were nothing either of us can imagine, because we are soft, lazy, demanding conformists, most of us not being able to get through a single day without a smartphone and snapping photos of every mundane and ordinary things around. Once there, the pople were brutally beaten, families separated (imagine this, at leas try to) and mostly sent straight to the gas chamber, but before that everything you would have had on you, including your clothes would have been taken away from you, so you were herded inside the concrete gas chamber naked. Then, after the metal door were shut-sealed behind, a complete darkness was broken by a slight beam of light up in the ceiling through which a granulated substance was spilled into the chamber. It was the Zyklon-B (Cyclone-B) grnaulate, known for being deadly when inhaled. The dying usually took even over 20 minutes. After that the bodies were removed and taken to crematorium (burning). 4. These tracks meant the freaking END OF LIFE for hundreds of thousands of innocent people like you. THE LAST MINUTES before they were killed. Get this simple truth! So balancing on these tracks is like dancing on somebody's grave. You do not dance, balance, walk, step-dance, do some other nonsense on a grave! This entire place, the entire German camp is a one big torture house and a grave. So behave with dignity and respect. Even at the famous cemetery, in Colleville sur Mer (Omaha Beach, D-Day if you were wondering) there are signs urging people to remain silent and behave acccordingly! Omaha Beach in Normandy is and will always be a mass graveyard where thousands of young Americans found their deaths. Same with Auschwitz. 5. These days, people, especially young folks, feel the overwhelming URGE to take snaps of every goddamn thing they see, eat, walk on, sit on, spit on, interact with. And those are the spoiled creatures commenting against the Museum's request to behave with decency. They have immense problems with understanding past, history, suffering, murder, death. IMMENSE PROBLEM. That's why they see it appropriate to behave like this. That's why they see nothing inappropriate in taking a F****** selfie on the Auschwitz railroad tracks which brought death to the innocent thousands. 6. What is exceptionally striking is the fact that most of those kids are from Israel. The truth - let's be completely frank now - is that they are brought under strict security supervision, on buses, on a round trip to places where they ancestors were killed. They visit Warsaw, go to the Museum of the Polish Jews, then are walked around the former Jewish Ghetto district, then they are driven to places like Jedwabne, and Treblinka. They are also taken to Auschwitz, Cracow, and Kielce. These are supposed to be very important history lessons for them. But judging by their behavior, they noisy and disrespectful way of conduct everywhere they go, it's becoming clear that the trip that was supposed to be a history lesson and a chance to learn and remember Pogrom, or Holocaust, or Shoah, is just another noisy trip for spoiled youths. Would you like to accuse me now of being rude or at least politically incorrect...? That's the truth, folks. 7. Walking on those tracks IS NOT a way of saying "hey, look, we are free now, we live in peace now". It's simply just another way of bragging about yet another place they've been to and a sick urge to post everything in their social media walls. That's just what it is and don't try to cover it with some teenage excuses. 8. Most of the people commenting here HAVE NEVER BEEN to Auschwitz and HAVE NEVER HAD THE CHANCE to experience its history. MANY of the people commenting here ARE NOT EVEN AWARE of the location and creators of the place. 9. MANY people commenting here, who justify what's being advised against in the article, is generally INCAPABLE of decent behavior and respect. That's the main issue here. It's not so much about the selfies in that particular place - it's about the bad manners and the lack of good upbringing in the first place. 10. AUSCHWITZ BIRKENAU (German), or OŚWIĘCIM BRZEZINKA (Polish) is a former GERMAN DEATH CAMP, located in POLAND, operating from 1940 till the liberation by the Soviets in 1945. Over 1,1 million Jews were killed there. 140-150 thousands Poles were killed there. And dozens of thousands of other nationals from the entire Europe. Thanks JIMIX, I think this & other places will get progressively roped off or fenced off as people will not get the message.I read the rationalisations & think how can one be so disconnected.I have never been to Auschwitz & am not sure I would want to go as I get a bit emotional if I go to the ANZAC DAY Dawn Service. As time progresses those who lived during this time are all almost gone,even children of the time are now elderly, a living link is lost & the significance can be diminished. Keep stirring the pot I guess. No, not me - I couldn't bring myself to visit such places. May their souls Rest In Peace. On the other hand I strongly believe in reincarnation so I hope they all now among us. How dare these youngsters not exploit the suffering of Poland like all those cashing in on the Holocaust media industry. Millennial ochlos websters are multiplying. I had the chance to visit Dachau when 13. It was a scaring experience as I did felt uncomfortable from the start, there's a terribly dark and powerful vibration here, and I don't understand how people could not feel it and respect the memory of all that happens in these places. Exactly! You must be very dead inside if you don't get that feeling. Or very unsecure and try to cope with it with continueing what you do normally - shoot some selfies. I dont blame those selfie guys. It's hard for many people to understad what is manner, what is respect. Many comments here is the good example. The commentators clearly show that they can NOT understand what's in the news. Why don’t the authorities simply ban photography there? It’s not that uncommon in some galleries, cathedrals, Hindu temples in India etc. There will always be some fool who will try to sneak a photo but in general the problem would be solved. I have to say that my memories of Auschwitz / Birkenau are enhanced and renewed by the photos I took (I hope respectfully) there 8 years ago. But then I was aware that even the dust in the air might be somebody's ashes. I left my camera on the bus. Didn't want the distraction. But I see the value you point to...but no chance in hell I'd want to combine me and it onto an image. Visited the site a month ago. Yes, many were taking selfies. No, they were not particularly playful or disrespectful. But I guess it is good to remind people to behave there. As a german I think it is fair to ask not to make playful selfies on the site. That beeing said, i always find it really encouraging that the human mind can cope with tragedies with humor and playfulness. Makes me feel like the good outweights the bad....... by a long shot. i don't see how the action of taking a self is being disrespectful. if the person would not take a self but say something disrespectful, that would be disrespectful. too many assumptions being made of the one on the tracks or doing a selfie. Disrespect is not about what you or I would see as disrespectful, but about what people who have suffered, or their family, or even the museum staff see as disrespectful. To give another example, in a church you're supposed to wear cloths with sleeves. Personally I don't see what difference it makes, as long as you're quiet, don't use flash when taking pictures, etc... but I would definitely feel uneasy if I entered a church in a swimsuit or something. I think it is pretty easy when the rules are given, either you comply and visit, or don't visit. Imagine you are posing at the graveyard!! Maybe in tie one where your grandma is buried ?? Angry yet?? Good. Now imagine it’s a graveyard for 1,000000 people. I still don't see the association with a selfie and disrespect. are you assuming that someone is having a good time every time they show where they are at with a selfie? let's turn this around : is there a rational reason why anyone would want a picture of themselves walking on a rail that lead thousands of people to their deaths? Maybe to show their Jewish friends that they went to this place where all these terrible things happened to feel empathy. ok, but why does one need to be on that picture? and why walk on the rails the way they do on the pictures above? it's not about empathy at all. i don't know their intent and am not going to pretend i can read their minds. Alas this behaviour is part and parcel of the narcissistic selfie millennial generation. Also don't underestimate the level of 'disconnect' they will have to WWII that ended over 75 years ago... Due to them being the 3rd generation on from the war.. It means little more to them from an emotional standpoint than playing 'Call of Duty' or 'IL-2 Sturmovik' on a computer. Of course this is a generalisation... But it would be impossible today for someone young to have a deep emotional connection to historical past events. Anyone who tries to argue the opposite is just being an apologist.. There are two totally opposite opinions here. 1. It is totally obvious to any decent human being that you shall behave with dignity and respect when visiting Auschwitz. It is sacred ground and you shall in a decent way remember the horrors and the people. This is no place for playfulness. Shame on those balancing on the rails while being photographed. What have become of today's people? 2. 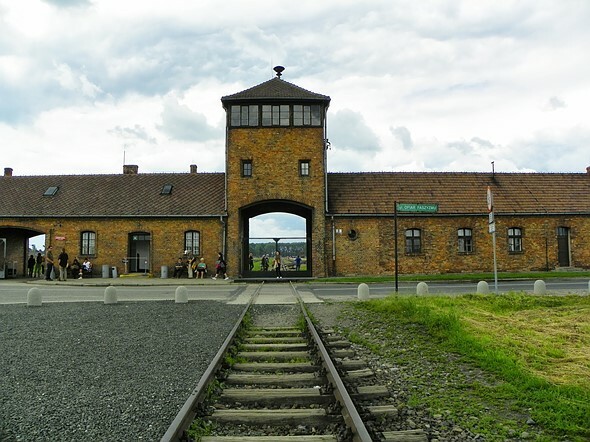 It has been chosen to make Auschwitz a tourist attraction. Even though many go there to pay respect and most do pay respect when they are there anyhow there are also a fair amount that only see it as a tourist attraction. Among those you will find a lot that do not come up to the respect standard you wish they would have and some are far from respectful. This is inevitable if it is a tourist attraction. If you do not want playful behavior and other annoying stuff you can only have very controlled "pilgrimage" travels. I don't think there's anything wrong with it being a tourist attraction. I went there as a tourist, and honestly it was very educational. I knew the facts, but until you see the place for yourself, it's hard to really understand how horrible it was. I encourage everyone to go there at least once. Not every tourist attraction has to be "fun." They can just be interesting, which Auschwitz very much is. But if the tourist is immature and only looking for fun, they should be going somewhere else. @Sad, I totally agree with you. And it is not in conflict with my number 2. It is just that you are making an assumption about other people being as respectful as you. In reality many are not. And you cannot just wish them away. And they are not necessarily bad people. It is not a "tourist attraction." It is a memorial...a place to remember the past so as not to repeat it. It is no more a tourist attraction than the Holocaust Museum in DC or Arlington National Cemetery. Just because it is open to the public doesn't mean that it's an amusement park. And honestly, if someone wants amusement, how do you choose to go there? I don't think the people who go there and take selfies are bad people, just woefully misinformed about the past and even being there, not really wanting to learn. But again, I don't get why they go there in the first place. Of course it is a tourist attraction. You will find lots of ads for it in lots of hotel lobbies and everywhere. It is one of those must see places. This planet is full of memorials that are tourist attractions. Obviously many here never had the chance to visit such a place. The human mind is not made to understand the systematic killing of millions of people - we can not really get it. But entering a gas chamber ... you immediately recognise there was something going incredibly wrong here. Inhuman. These places are important to get a feel about what was going wrong in history on so many occasions (not only the Nazis - this happened so often all over the world). And it always can happen again if we don't take care. No, a monument can not give you that understanding. And history lessons can't. Go there, put you on the spot where 100.000 people get killed. You will immediately understand. Not sure I would want to photograph anything at Auschwitz. Actually, not sure I would even want to visit. It's just too sad, so many people died there. It amazes me how un-aware people are of their actions and can't think of anything larger than themselves. Yeah, they are not selfies, but they are inappropriate for the location and history. Imagine if their grand-parents had been killed there, then maybe they would (should) behave differently. It's an unfortunate trend in society, being self focussed & only thinking of self. Thankfully there are still those that think of others first. 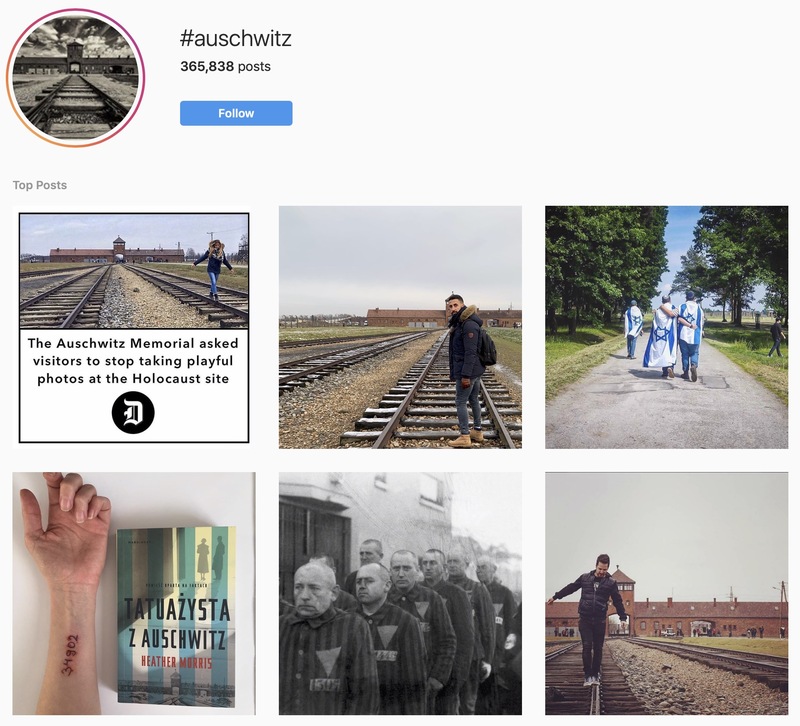 A while ago there was an art project in Germany called Yolocaust (see www.yolocaust.de ) where the artist Shahak Shapira did photoshops of people who took disrespectful selfies at the Holocaust memorial in Berlin. I agree with the Auschwitz Museum intention to ask people to think about the meaning of the place, including when they take photos there. I'm not religious, but the older I get the more I see wisdom in the quote "Let him who is without sin cast the first stone." To those who are eager to criticize people taking pictures or having fun at that site, I wonder how self critical you are of yourself? I agree with them fully. Of course it is not correct behavior to play on the rails. But, I am not sure I understand why the tell it in social media. And I am not sure I like them hanging out photographers that have misbehaved. Why not tell the visitors that they are not welcome if they do not behave? Like they do in certain churches. Anyone stupid enough to "need" to be told how disrespectful taking a selfie at Auschwitz is, is probably to stupid to understand why its so disrespectful. Too bad that none of the photos were selfies. You didn't read the article with a critical mind. This article was clickbait and it got you seething. Whose the stupid one now? @paleodawg: that's beside the point. Whether those people made a selfie or someone else took the picture doesn't matter at all. I can't imagine trying the balance act on Auschwitz rail tracks. However disrespect comes from intent. What those Instagram people do there is probably not intent of disrespect, it may be their own way to deal with the place. Because really how do you even handle being at such a place? Honestly the only human thing to do would be to break down in fetal position and cry. If you don't want to do that, you need to deal with it... Somehow. This may be a way for some. I wouldn't be so quick to judge and scream disrespect. yes lets treat adults , or what is hoped pass for adults , as children ? > This may be a way for some. I beg to differ. Whatever but balancing on the rails. Occam Razor comes to mind: that youth just have no idea of the immensity of the tragedy. "They did not greet us, nor did they smile; they seemed oppressed not only by compassion but by a confused restraint, which sealed their lips and bound their eyes to the funereal scene. It was that shame we knew so well, the shame that drowned us after the selections, and every time we had to watch, or submit to, some outrage: the shame the Germans did not know, that the just man experiences at another man's crime; the feeling of guilt that such a crime should exist"
Harsh, but I have to agree with you. That is indeed the root of it. Anything goes. Controversy and scandals are now totally acceptable means of getting attention, clicks, and everything that goes with them. In the end, society will pay dearly for all that. Cosinaphile It's nice to know what's in other people's heads without talking to them. Will you teach me that skill? I don't agree... if you don't know the local customs you can disrepect someone, people or even religion, and be unaware of it. We teach young people not to respect anything or anyone? Why would they make an exception for Auschwitz? If they have to respect those that died there, perhaps they'll have to respect the soldiers that liberated it? Perhaps the military? Oh, oh, can't have that! Another click-bait title? Auschwitz authorities asked not to take "playful photos", not "selfies". If fact, the latter is *never* mentioned even in the article, let alone source materials (but carefully added to the title and tags -- it's such a good trigger of photogs' rage... and clicks). Good job, DPR. If I were Amazon shareholder, I'd be proud of you. As an example; scrup asks below: "What is so offensive about the selfies." Well, nothing. It's disrespectful photos that are a problem, photographers should understand what are they taking pictures of. In this particular case, they are at the site of death of more than a million people. But many people do not read beyond headlines, and voila, we have another selfie bashing session here, whereas the focus should have been completely different. Good find Vadims, the article is indeed misleading. There are no selfies mentioned or visible at all. What DPReview has done is make the ultimate click bait article by having the title contain the words auschwitz + selfie. That is a sure recipe for getting a heap of seething comments. One problem is that most people lack a proper knowledge of history and thus a respect for it. There is that old saying: those who do not remember the past are condemned to repeat it. The people taking the selfies are not bad people, but simply have no clue as to the gravity of what happened at this site. They may have a cursory knowledge but have not absorbed the true lessons. "are not bad people, but simply have no clue as to the gravity of what happened "...….... sounds like the old excuse .. could be applied to this period of history in Germany as a whole ?? Whatever .. these people are stupid. Further .. This place should NOT be referred to as a MUSEUM !! Anti-semitism is on the rise again in Europe and the US. A significant minority are Holocaust deniers, and even more have no knowledge of what actually occurred. As long as the world thinks it's OK for one "religion" to call for the extinction of Jews, the potential for another Holocaust rises. Perhaps we, collectively as one human species, need to grow up and shed some of the silly, evolutionarily childish baggage we carry. Religion certainly is one of those silly artifacts that almost, kind of made sense in a world thousands of years ago but surely has no place today. The answers religion has tried, and consistently failed, to provide have long, long since been superseded by superior knowledge gained through direct observation. No more religion > no more religious born conflict. See, wasn't that easy. Similarly, perhaps it's time we drop the pride we almost all hold for our individual origins, transferring those origins into allegiances, which like religion set up the foundations for conflict. Nationalities, ethnicities, race etc. As long as we hold some significance to these trivial elements, we maintain a lever for comparison to say "I am better than you". Say it with me, "I am human". Full stop. @tailings. Problem is that someone is always trying to gain an advantage and "religion" is a lever. The best recent example is the "religion" of green. If you don't go along with what a "consensus of scientists" (BS by the way) have to say, then you are surely either evil or an idiot and to be ignored. There is no doubt that we have environmental problems (too many people as the root cause), but the sweeping mandates of the greenies are just a new religious mechanism to gain control. @Dragonrider - What you speak of is a conflation of two separate issues. Science is often misapplied by various ideologies to fuel an agenda. But that does not equate to science as religion, which has been said many times. The fundamental principals of the universe do not care whether you or I believe in them. It is the aim of science to uncover these fundamental principals. Whether we choose to believe what science reveals about our universe is entirely up to us, but the fundamental principals will still behave the same regardless. Said another way, 'You can't argue with gravity.'. @tailings. No argument re the nature of true science. Just pointing out that there will always be "religion" because a majority of humans are frankly unable to stand on a mountaintop, look up at the stars, and accept that they are really that small in the overall scheme of things. True science is not about believing, but rather about constantly questioning the current belief set. Throughout history, it has never been the "consensus" that moved knowledge forward, but rather the often persecuted lone wolves who questioned the belief set of the day. Moving to a more complex, sophisticated scientific process has not and will not change that. The difference between an engineer and a physicist is that an engineer knows that if he does something tomorrow exactly the same way he did it yesterday, he will get the same result. OTOH, the physicist is likely to have a new explanation for why the engineer got that result (but it doesn't change the result).
" Religion certainly is one of those silly artifacts that almost, kind of made sense in a world thousands of years ago but surely has no place today." What we need is true religion...Love God, love you neighbor as yourself. Without both we will never have peace. The world is on a crash course to repeat the history of the Holocaust on a grand scale. @tailings: thanks, somebody gets it (well, of course you're not first). Problem is, people always take something too serious, be it religion, science, self import, "honour" (the wrong kind), greed, ... so the potential for conflict and atrocities will never cease I fear. Where do I even begin. Atheism is a religion in itself. Those who suffocate themselves in the denial of religion and freedom to express the same have been the biggest killers in the history of mankind. The atheist like the OP believes religion is the evil, whereas I believe, "man" will create evil regardless of non-secularists. Man hates whether it be color of skin, country of origin, wealth, language and even religion. in fact science has led to some of the greatest atrocities of mankind so save the pointless polemics. Lastly, this had NOTHING to do with religion. To bring up religion as an excuse for genocide is a travesty from my perch. ... many\some great physicists today are slowly beginning to understand that belief in a creator of the universe, and therefore in life and humanity is a tangible , explore-able concept in the search for ultimate truth, and there is nothing , in itself , dangerous in believing in a creator . , in a thoughtful non dogmatic manner. @tailings Squeezing your post to get a meaning one gets the message that humans are not perfect. That's a novel idea deserving Nobel prize. Religion is just set of ideas and I am puzzled why you charge religion with all the calamities humanity faced. People can do great and bad acts in the name of religion, religion by itself can only be forgotten. Overall I would think we are on the plus side given the fact that we progressed to the point we are now so religion can't be so bad. Additionally, I lije your cause-effect reasoning. I am kind of cross today as I woke up on the wrong foot. That's why I am writing that sarcastic remark. Instead of working at taming my temper I should, following your way of diagnosis, probably cut my left foot and be closer to your view of paradise. "Atheism is a religion in itself." Atheism is the absence of religion. If religion never existed, we wouldn't create the definition of a religion to describe atheism. "Religion is just set of ideas and I am puzzled why you charge religion with all the calamities humanity faced. " What? I certainly didn't make such a sweeping statement. Me thinks you have extrapolated a wee bit, much more than you have accused me.
" the fact that we progressed to the point we are now so religion can't be so bad." Unrelated cause and effect. It is sunny today because I ate ice cream yesterday. ">snip<....probably cut my left foot and be closer to your view of paradise." A spurious comparison of cause and effect at best. In your case, I >know< cutting off my foot would make things worse. In my case, I >know< religion has been the instigating source for many, many conflicts through history. Whether religion has done good for humanity as well is certainly debatable, (I believe that it has). BUT, has it done enough good to merit all the bad that has come with it? Me thinks not, because I believe we, as humans, can make the good without it. Respect is seen less and less in all aspects of our lives. Social media has never been the place to look for Respect. Its a double edge sword. They want the social presence and the sale of educational material, guidebooks and memoirs etc to fund the upkeep just like in Yad Va Shem. With the current generation build some selfie opportunites on site. Use this behavior or just start having people guard the train tracks and any other area you don't want joyful photos taken and Shss them off. My grandparents never wanted to talk about those days and the numbered tattoos. Most kids would balance on a train track no matter where they find it. What’s wrong with a little bit of taste and respect, it’s a site of mass killing there are likely to be families of decendants. I don’t think it’s twisting anyone’s arm to show some restraint with selfies at such a place with that kind of history. pretty sure the deceased dont care what happens around their tombstone. Unless the dead complain, anything goes. Sounds like a one size fits all justification for doing absolutely anything. the problem at hand is a museum operator wanrs as many paying visitors as possible and then complains bitterly if some of the visitors dont behave exactly they way they would like them to. political correctness fascism of sorts. operators of "disaster zone tourism hot spots" should be happy as long as the hordes of tourists they take entrance fees from dont start to deface or damage the monument or commit truly disrespectful acts like eg "partying in a former gas chamber". taking selfies while balancing on a rail track in front of a museum on public grounds should really be a non-issue. The museum is there to remind people of the past so that we can learn from it; it's not some great profit operation. The fees collected are simply to maintain the museum. No one is getting rich off of it. Yes, this should be an issue, because it gets to the heart of why the museum exists: to know the past so as to learn from it and not repeat the same mistakes. i am not taking selfies there, just pointing out the facts. it is impossible to have masses of visitors/tourists at any place without having "less desirable side effects" as well. those who consider the buildings of a former concentration camp as a sacrosanct shrine should really fund it with donations and have it totally closed to the (general) public. and definitely no school classes to be brought there, whether the kids want to or not. then you might not have to suffer the terrible disrespect and sacrilege of some kids taking selfies on a tail track in front of the museum there. Give this a little more thought. There are visitors there who are survivors and the families of survivors. They are there to mourn. Should tourists be disrespectful of the living? Try taking selfies at Arlington national cemetery and see what happens. Photo's such as these are reflective of people who have little or no reverence for places such as these and most likely have little knowledge of its history. Add to that new generations of idiots who do things only because they can and or to post on social media to celebrate themselves. Technology is advancing at a rate exponentially faster than people's ability to use reason and discretion. Every day theres probably hundreds of new techie capabilities developed, some people resist but far too many immerse themselves with no self control. Its become an addiction and a bonafide disease. Its really sad for me to watch. Which generation cares about a previous one anyways? Will people in the 25th century care about our present generation or do you care about those who lived in the 15th century? Who really cares. I mean come on. We live in a world of people taking selphies. It’s a photo showing you visited a place. Why does it have to be considered disrespectful ? As mentioned here. Where do you draw the line? “If you’re offended by something, that’s your problem. Not everybody else’s !”- Ricky Gervais. It's not only in Auschwitz. Seeing those disrespectful tourist climbing around on our Holocaust Memorial in Berlin is so disgusting. You really see how primitive, disrespectuful and uneducated those people are. The security try to get them from jumping around on it, but they can't get them all. They should give them tickets for their actions. it is nothing but a collection of stone slabs occupying a large public space. not a church or temple interior during service. no reason why people should not enjoy themselves, as long as they dont damage or deface a location. I'd agree with xeppelin there. I've been there twice, I don't think I went jumping on them but it's hard to resist to a game of hide and seek or the opportunity to take a nice picture. Having visited a labor camp near my hometown, you can't compare them, in a place like this you know exactly what happened, whatever you read gets real. The Jewish Museum has, in my opinion, art that better represent dispair and suffering. @xeppelin just because you don't understand or respect the place, you don't have to jump around and having fun there. It's still a memorial. Do something like this in other countries and you would recieve punishments for beeing that disrespectful. Even the wailing wall is just a wall. It's about for what it stands. i am not saying people should behave any way they want, any time, anywhere. But any monument or memorial open to the public that attracts lots of visitors will also attract some that don't behave "as intended". That's just a fact of life. As long as the "misbehaviour" does not damage or deface the structure or really disturb [most] other ["civilized"] visitors, i don't see any need for "interdictions and/or punishments". Enough already forbidden in life today. I hate selfies. Just saying. I would not say "hate". Singular selfies now and then is OK. But, when it all is about selfies it gets a bit awkward. I once, on the subway, saw a pretty boy (maybe 20 years old) that looked through lots of pictures on his phone. They all were of himself. Hundreds of them. Maybe those two guys we have seen had good reasons? Maybe they were models or actors? And used it as training? "I hate selfies. Just saying." Obviously you need a new phone with more gooder selfie cameras in it. So do I, AshMills. It's a totally idiotic "trend", to take & post always so called "selfies" everywhere - it does only grew a generation of narcissistic disordered ppl., see Trump! Even twittering all day nonsense. People into 2019 generally are being too superficial, and unsocial networks are enhancing this question-able "trend" even further. I visited Auschwitz-Birkenau for the first time this past Fall and while I walked around and took photos of the site, when I got back to my hotel I couldn't come to grips with the idea of sharing any of them - even though I regularly use social media to share travel photos. There is something so emotional and damaging about the site, it felt wrong to trivialize it in any way. I kept the photos and will look at them myself and with my family, to remind me of how broken I felt when standing on the site, and the horrors that took place there, but I wouldn't dream of trying to profit from them in any way. What took place at Auschwitz during the war was one of the worst crimes against humanity in the history of the human race. I agree that taking a playful selfie there is in poor taste, but let's keep things in perspective. Afterall the freedom we have to even be able to do this was one of the reasons the world fought back against the tyranny of the Nazis. This "disrepectful" thing is nonsense. Also the Coliseum in Rome was a slaughterhouse for Christians. No selfies also there then. His comparison is not only nonsens, it constitutes an anti-humanistic relativization of the Shoah. exactly. shoah/holocaust eas a terrible atrocity in mankinds long history of attocities and genocide. not the worst one, not the largest one in terms of himans kilked and unfortunately not the last one. the only "new" thing about it was the "industrialized, modern technology at the time method" the nazi murderes used. terrible beyond words, but not singular in any way. @Hubertus Bigend: of course is a relativization, that's what history is for. It's when you treat history with an agenda that you'll end up with an "holocaust museum" in Washington D.C. and no museum on the Genocide of Native Americans there (or, if you prefer, no Armenian Genocide museum in Turkey). The stupid people that take Selfies are complete and utter idiots. If they are caught doing it, they should have there phones/cameras confiscated and be heavily fined. No doubt these 'people' think its cool, just how little they know what horrors took place by these german r-soles. ... what they do is not obviously a criminal offense and cannot therefore be punished. ... many young people are shipped by buses to those places because their schools or parents have so decided. They are not there of their own choice. ... taking this selfies might not be considered as disrespectful by those taking them. They might be very aware of the horrors and suitable respectful. We do not know that. Roland Karlsson - If they are, which I hope these people are aware of the crimes that had been committed, why take a selfie' in the first place. The act of doing this is probably to share on social media that 'Hi, I'm here...like me please'. If its a school trip, then the teachers should have made aware to students that its should not be done, this act alone is disrespectful to the lost love ones and many many families that have been affect by this event. Of course photography should be allowed for the purpose of editorial content and as evidence what crimes humans do to each other. Selfie, in my opinion do NOT fall into this category, thanks. photomedium - A fine of equipment confiscation is not the road to murderous actions, its a stupid remark and seems to show a lack of respect on your part. Yes, we shall all show respect. And teachers are responsible for the kids, etc, etc, ... that is how life works. But, as we are well aware, the world is not a perfect place where all are nice and everyone agrees upon how to behave. So, if someone fools around on those tracks it is worthy of a scolding, not more, as long it is not made illegal. And then a sign should say so, for the tourists, that cannot guess. Boy am I glad I don't leave in the NickyB state! I am not a big fan on your remedies or of your overzealous law enforcement style in general, which is the reason why the places in question were created in the first place. This is not vandalism, this was simple lack of manners by some teenagers. If you are breaking such rules you should simply be asked to leave. Shame on those who doesn't even have a bit of common sense! It's the age of the disconnected always connected social media idiots who don't have manners and think they are the centre of the universe. We're raising an army of clinical narcissists. It's not about manners, it's about logic and thought. The silly selfies can be taken anywhere, on any tracks, why would anyone even take selfies over there? seriously, makes no sense. When my partner and I visited the Auschwitz Museum, I had brought my camera along, but I never felt comfortable pulling it out. That's because you and your partner have respect. Some others do not I'm afraid to say. Are you seriously saying that photographing at Auschwitz is disrespectful? Photographing at all? Roland, not even close to what I said. I said I was not comfortable. I absolutely think it should be photographed, it even occurred to me as a series of serious photographs where the Museum or part of it is the subject. I have my own set of rules for personal conduct, yours may differ. My partner did take a few photographs from outside the museum because we thought it was important we share our experience with friends and family - still it was uncomfortable. When my partner and I finally visit, I am pretty sure my camera is staying in the hotel. What others choose to do is not my business, but playing on the tracks seems especially stupid and disrespectful. And photographers who stand on the rails to take ‘serious’ photos? I have seen many such photos in photo competitions. What is the difference between taking a selfie and taking a photo for personal gain by entering it into a competition? It seems the problem is one of intent. Are you trying to record the site in a way that makes the viewer think of what the site represents or Is the photo about you rather than the barbaric history of the site itself? It 's a reflection in many ways. The reflection of yourself (selfie) and your behavior. While it's indeed a matter of intent and respect, I cannot think of many valid reasons for new, 'serious' photographs of those rails, either, after they've been photographed by millions of people millions of times. There is not much new insight to be gained from another photograph, even if it's meant to be 'serious', especially if it indeed is more about the photographer than it's about the subject when someone enters it into a competition. i cannot think of any reason to visit a former concentration camp location. millions of people have visited already. why more visitors. same stupid brainless non-logic as "no new photographs needed, enough taken already". hope the former kz sites will crumble soon and be replaced by a simple tombstone/memorial marker. that should be enough of a physical artefact to remember lost lives, mass-murdered fellow humans and any gruesome event in history. "i cannot think of any reason to visit a former concentration camp location"
And that's how we all knew that everything that came after was a load of thoughtless BS too.